Finding work can be a struggle, there’s so much competition for each and every position that’s advertised. Well, If you're a hard working, determined individual aged 16-18 looking to kick start your career CTC’s Traineeship programme is for you! The programme runs for a total of six months and gives the individual an unpaid work placement at the company of their choosing from Cumbria Training Centre’s large list of vacancies. Now, although the thought of six months unpaid work may seem unattractive to some, what you gain over this period is valuable work experience where you learn new and important skills, learn to work as part of a team and develop a skill set that will help you stand out from the crowd. You’ll also complete a vocational qualification and gain functional skills in Maths and English (if you haven’t already achieved the required qualifications in your GCSE’s. So what’s stopping you stepping into work? Stand out, gain experience, build your confidence and skill set and enrol today! 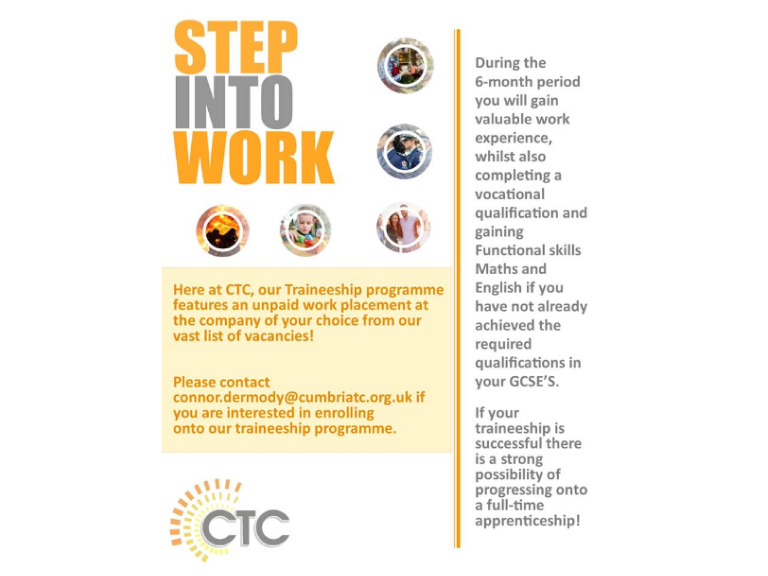 If you would like to know more about the traineeship programme, or would like to enrol then please email connor.dermody@cumbriatc.org.uk or phone Cumbria Training Centre on 838892.